Have an old barn in need of repair? There are a variety of programs for preservation of historic barns including federal and state tax credits and grants. An investment of time and effort is required to complete the paperwork and present the story of your barn—but the payoff can be worth it. A federal income tax program allows a credit equal to 20 percent of the amount spent rehabilitating historic barns that are listed on or determined eligible for the National Register of Historic Places. This federal program has been administered by the National Park Service since passage of the Tax Report Act of 1976. To date, over 30,000 buildings have been rehabilitated, including many barns! 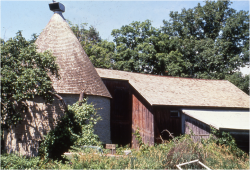 An informative technical bulletin created by the National Park Service explains how these tax credits support historic barn rehabilitation. For additional information on the historic tax credit program and its impacts on Preservation, just visit the Federal Historic Preservation Tax Incentives website. Some individual states have passed laws to provide historic tax credits to barn owners as well. We suggest that you contact your state historic preservation offices to see if your state has tax credits or other preservation grant programs.